This Andalusian horse has a completely white hair coat, but the underlying black skin still confirms that the horse is a gray and neither white nor sabino. Gray or grey is a coat color of horses characterized by progressive silvering of the colored hairs of the coat. Most gray horses have black skin and dark eyes; unlike many depigmentation genes, gray does not affect skin or eye color. Their adult hair coat is white, dappled, or white intermingled with hairs of other colors. Gray horses may be born any base color, depending on other color genes present. White hairs begin to appear at or shortly after birth and become progressively lighter as the horse ages. Graying can occur at different rates—very quickly on one horse and very slowly on another. Gray horses appear in many breeds, though the color is most commonly seen in breeds descended from Arabian ancestors. Some breeds that have large numbers of gray-colored horses include the Thoroughbred, the Arabian, the American Quarter Horse, the Percheron, the Andalusian, the Welsh pony, and the most famous of all gray horse breeds, the Lipizzaner. People who are unfamiliar with horses may refer to gray horses as "white". However, a gray horse whose hair coat is completely "white" will still have black skin (except under markings that were white at birth) and dark eyes. This is how to discern a gray horse from a white horse. White horses usually have pink skin and sometimes even have blue eyes. Young horses with hair coats consisting of a mixture of colored and gray or white hairs are sometimes confused with roan. Some horses that carry dilution genes may also be confused with white or gray. While gray is commonly called a coat color by breed registries, genetically it may be more correct to call it a depigmentation pattern. It is a dominant allele, and thus a horse needs only one copy of the gray allele, that is, heterozygous, to be gray in color. A homozygous gray horse, one carrying two gray alleles, will always produce gray foals. Gray is common in many breeds. Today, about one horse in 10 carries the mutation for graying with age. 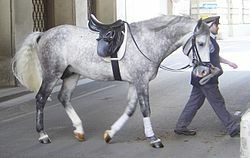 The vast majority of Lipizzaners are gray, as are the majority of Andalusian horses. Many breeds of French draft horse such as the Percheron and Boulonnais are often gray as well. Gray is also found among Welsh Ponies, Thoroughbreds, and American Quarter Horses. All of these breeds have common ancestry in the Arabian horse. In particular, all gray Thoroughbreds descend from a horse named Alcock's Arabian, a gray born in 1700. The gray coat color makes up about 3% of Thoroughbreds. Gray also occurs in spotted horses such as pintos or Appaloosas, but its effects wash out the contrast of the markings of these patterns. For this reason, some color breed registries refuse or cancel registration of gray horses. A gray mare with suckling foal. The light hairs around this foal's muzzle and eyes indicate that it will gray like its mother. Not all foals show signs of graying this young. A gray foal may be born any color. However, bay, chestnut, or black base colors are most often seen. As the horse matures, white hairs begin to replace the base or birth color. Usually white hairs are first seen by the muzzle, eyes and flanks, occasionally at birth, and usually by the age of one year. Over time, white hairs replace the birth color and the horse changes slowly to either a rose gray, salt and pepper (or iron gray), or dapple gray. As the horse ages, the coat continues to lighten to a pure white or fleabitten gray hair coat. Thus, the many variations of gray coloring in horses are intermediate steps that a young horse takes while graying out from a birth color to a hair coat that is completely "white." Different breeds, and individuals within each breed, take differing amounts of time to gray out. Thus, graying cannot be used to approximate the age of a horse except in the broadest of terms: a very young horse will never have a white coat (unless it is a true white horse), while a horse in its teens usually is completely grayed out. One must also be careful not to confuse the small amount of gray hairs that may appear on some older horses in their late teens or twenties, which do not reflect the gray gene and never cause a complete graying of the horse. This change in hair color can be confusing. Many new horse owners, not understanding the workings of the gray gene, are disappointed to discover that their dapple gray horse turns completely white a few years later. Other times, people traveling with gray horses who have a pure white hair coat have encountered problems with non-horse-oriented officials such as police officers or border guards who are unclear about a horse who has papers saying it is "gray" when the horse in front of them appears white. To further complicate matters, the skin and eyes may be other colors if influenced by other factors such as white markings, certain white spotting patterns or dilution genes. This yearling Arabian horse originally chestnut or bay, could be misclassified as roan. This stage is often called rose or iron gray. An intermediate stage in young horses that are in the early stages of turning gray is sometimes called "salt and pepper," "iron gray," or "steel gray." This coloring occurs when white and black hairs are intermingled on the body, usually seen in horses that are born black or dark bay. This is the most common intermediate form of gray, which can give a silvery look to the coat. "Rose gray" is a term used to describe this intermediate stage for a horse born a chestnut or lighter bay color. While these colors are "graying out," both red and white hairs are often mixed on the body. Thus rose gray horses have a slight pinkish tinge to their graying coat. These horses are sometimes confused with roans, but a gray continues to lighten with age, while a roan does not. Roaning also causes fewer white hairs on the legs and head, giving the horse the appearance of dark points, which is usually not true of gray. The dapple gray coat of this mature Mangalarga Marchador is becoming white, and the horse will eventually be completely white-haired. "Dapple gray" is an intermediate stage not seen on all grays, but often considered highly attractive. It consists of a dark hair coat with "dapples," which are dark rings with lighter hairs on the inside of the ring, scattered over the entire body of the animal. It is another possible intermediate step in the graying process of the horse. Dappled grays should not be confused with the slight dappling "bloom" seen on horses that are very healthy or slightly overweight, as "bloom" dapples disappear should the horse lose condition. This Arabian mare is a "flea-bitten" gray. Note red speckles on white hair coat. A horse that has completely changed its base coat will either be pure white or "flea-bitten" gray. Flea-bitten gray is a color consisting of a white hair coat with small speckles or "freckles" of red-colored hair throughout. Most horses who become flea-bitten grays still go through a brief period when they are pure white. The flea-bitten pattern, like freckles on a human, can also vary: Some horses may appear almost pure white, with only a few speckles observed on close examination. Others may have so many speckles that they are occasionally mistaken for a roan or even a type of sabino. One unique form of flea-bitten gray is the "bloody shouldered" horse. This is an animal that is so heavily flea-bitten on certain parts of the body, usually the shoulder area, that it almost appears as if blood had been spilled on the horse, hence the name. Arabian horse breeders hold the view that traditions of the desert Bedouin people considered the "bloody shoulder" to be a prized trait in a war mare and much desired. The flea-bitten pattern comes about because of somatic loss of the duplication that causes graying with age, enabling normal pigmentation to be reestablished. Generally only occurs in heterozygous Grays. The gray gene (G) is an autosomal dominant gene. In simple terms, a horse which has even one copy of the gray allele, even if it has a gene for another coloring, will always become gray. If a gray horse is homozygous (GG), meaning that it has a gray allele from both parents, it will always produce gray offspring. However, if a gray horse is heterozygous (Gg), meaning it inherits one copy of the recessive gene (g), that animal may produce offspring who are not gray (depending on what color gene an offspring inherits from its other parent). Conversely, a gray horse must have at least one gray parent. Genetic testing is now possible to determine whether a horse is homozygous or heterozygous for gray, or if it does not carry the gene at all. The gray gene does not affect skin or eye color, so grays typically have dark skin and eyes, as opposed to the unpigmented pink skin of white horses. In 2008, researchers at Uppsala University in Sweden identified the genetic mutation that governs the graying process. The study also revealed that gray horses carry an identical mutation that can be traced back to a common ancestor that lived thousands of years ago. The discovery that gray can be linked to a single animal provides an example of how humans have "cherry-picked" attractive mutations in domestic animals. Gray is controlled by a single dominant allele of a gene that regulates specific kinds of stem cells. The identification of the gray mutation is also of great interest in of medical research since this mutation also enhances the risk for melanoma in horses; About 75% of gray horses over 15 years of age have a benign form of melanoma that in some cases develops into a malignant melanoma. The study of gray genetics has pointed to a molecular pathway that may lead to tumour development. Both STX17 and the neighboring NR4A3 gene are overexpressed in melanomas from gray horses, and those carrying a loss-of-function mutation in ASIP (agouti signaling protein) had a higher incidence of melanoma, implying that increased melanocortin-1 receptor signaling promotes melanoma development in Gray horses. Many people who are unfamiliar with horses refer to a gray horse as "white". However, most white horses have pink skin and some have blue eyes. A horse with dark skin and dark eyes under a white hair coat is gray. However, a gray horse with an underlying homozygous cream base coat color may be born with rosy-pink skin, blue eyes and near-white hair. In such cases, DNA testing may clarify the genetics of the horse. Some grays in intermediate stages of graying may be confused with a roan or a rabicano. Some heavily fleabitten grays may also be confused with roans. However, roans are easily distinguishable from grays: roan consists of individual white hairs on a dark base coat, usually with the head and legs of the horse darker than the rest of the body. Rabicanos also have intermixed white hairs primarily on the body with a dark head. With gray horses, the head is often the first area to lighten, especially around the eyes and muzzle. Also, roans do not lighten with age, while grays always do. The varnish roan is another unusual coloration, sometimes seen in Appaloosa horses, that, like gray, can change with age, but unlike gray, the horse does not become progressively lighter until it is pure white. Varnish roans are created by the action of leopard complex within breeds such as the Appaloosa and are seldom seen elsewhere. The dilution genes that create dun, cream, pearl, silver dapple and champagne coloring may occasionally result in confusion with gray. Some horses with a particular type of dun hair coat known as a "blue dun", grullo, or "mouse" dun appear to be a solid gray. However, this color is caused by the dun gene acting on a black base coat, and horses who are dun have all hairs the same color; there is no intermingling of white and dark hairs. Also, dun horses do not get lighter as they age. Horses that are a light cream color are also not grays. These are usually cremello, perlino or smoky cream horses, all colors produced by the action of the cream gene. However, if a gray parent passes on the gene, the hairs will turn white like any other gray. Another cream-colored dilution, the pearl gene or "barlink factor", may also create very light-coated horses. Similarly, the champagne gene can lighten coat color, often producing dappling or light colors that can be confused with gray. In spite of its name, the silver dapple gene has nothing to do with graying. It is a dilution gene that acts only on a black coat, diluting the coat to a dark brown and the mane to a flaxen shade. 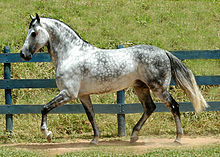 Horses that express the silver dapple gene (and do not have the gray gene) are born that color and it will not lighten. However, again, if one parent passes on the gray gene, the gray gene will again be dominant. Throughout history, both gray and white horses have been mythologized. As part of its legendary dimension, the gray horse in myth has been depicted with seven heads (Uchaishravas) or eight feet (Sleipnir), sometimes in groups or singly. There are also mythological tales of divinatory gray horses who prophesy or warn of danger. ^ a b c d Locke, MM; MCT Penedo; SJ Brickker; LV Millon; JD Murray (2002). "Linkage of the grey coat colour locus to microsatellites on horse chromosome 25". Animal Genetics. 33 (5): 329–337. doi:10.1046/j.1365-2052.2002.00885.x. PMID 12354140. The progressive loss of colour in the hair of grey horses is controlled by a dominantly inherited allele at the Grey locus (G^G). Foals are born any colour depending on the alleles present at other colour determining loci. The progressive loss of colour in the hair of grey horses is controlled by a dominantly inherited allele at the Grey locus (GG). Foals are born any colour depending on the alleles present at other colour determining loci. After birth, horses carrying the GG allele begin to show white hairs that are intermixed with their original hair colour. Although the rate at which horses will turn grey is variable, the amount of white hair increases with age until the coat is completely white at maturity. Pigmentation of the skin and eyes is not affected by GG. Dark skin distinguishes the grey phenotype from that of pink-skinned cremello and white horses. ^ Swinburne, JE; A Hopkins; MM Binns (2002). "Assignment of the horse grey coat colour gene to ECA25 using whole genome scanning". Animal Genetics. 33 (5): 338–342. doi:10.1046/j.1365-2052.2002.00895.x. PMID 12354141. All grey Thoroughbred horses trace back to the Alcock’s Arabian (b1700). ^ Willett, P. (1989). The Classic Racehorse. London: Stanley Paul. p. 24. ISBN 0-8131-1477-2. ^ "Holly". www.babsonarabians.com. Retrieved 4 April 2018. ^ a b Rosengren Pielberg, G; Golovko, A; Sundström, E; et al. (August 2008). "A cis-acting regulatory mutation causes premature hair graying and susceptibility to melanoma in the horse". Nat. Genet. 40: 1004–9. doi:10.1038/ng.185. PMID 18641652. ^ Pielberg, Gerli Rosengren; Anna Golovko; Elisabeth Sundström; Ino Curik; Johan Lennartsson; Monika H Seltenhammer; Thomas Druml; Matthew Binns; Carolyn Fitzsimmons; Gabriella Lindgren; Kaj Sandberg; Roswitha Baumung; Monika Vetterlein; Sara Strömberg; Manfred Grabherr; Claire Wade; Kerstin Lindblad-Toh; Fredrik Pontén; Carl-Henrik Heldin; Johann Sölkner; Leif Andersson (2008). "A cis-acting regulatory mutation causes premature hair graying and susceptibility to melanoma in the horse". Nature Genetics. 40 (8): 1004–1009. doi:10.1038/ng.185. PMID 18641652. Wikimedia Commons has media related to Grey horses. This page was last edited on 11 February 2019, at 02:08 (UTC).